Phoebe’s favorite word is glissading. She loves the way it glides on the tongue. She analyzed this word as <gliss+ade> confirming the existence of the suffix <-ade> with words such as lemonade, blockade, parade all before she turned to resources. We discovered that <-ade> is a suffix from French. It forms nouns and carries the suggestion of movement and action or groups performing an action and is derived ‘ from Latin -atus, past participle suffix of verbs of the 1st conjugation to become <-ade >in French’ (in Spanish -ado, Italian -ato) In English, we retain the Spanish form of desparado. Detail of Botticelli’s Madonna of the Pomegranate, 1487. Perhaps the most interesting of words with the suffix <-ade> is grenade. Who would have thought the beautiful pomegranate could have been etymologically connected to a weapon of destruction? Certainly not Phoebe or me! Ayto tells us that the first grenades were spherical and with the wick on top, the explosive device ‘bore more than a passing resemblance to pomegranates.’ Old French pome grenate or just grenate altered to grenade under the influence of granada. Pomegranate, the 14th century compound word, is etymologically ‘the many seeded apple’, <pome> being apple and <gren+ate> “having grains,” from Latin granata’, its ultimate ancestor being Latin malum granatum. As well as grenade you can see this fruity connection in garnet, and pomanders– the apple shaped balls filled with pot-pourri. 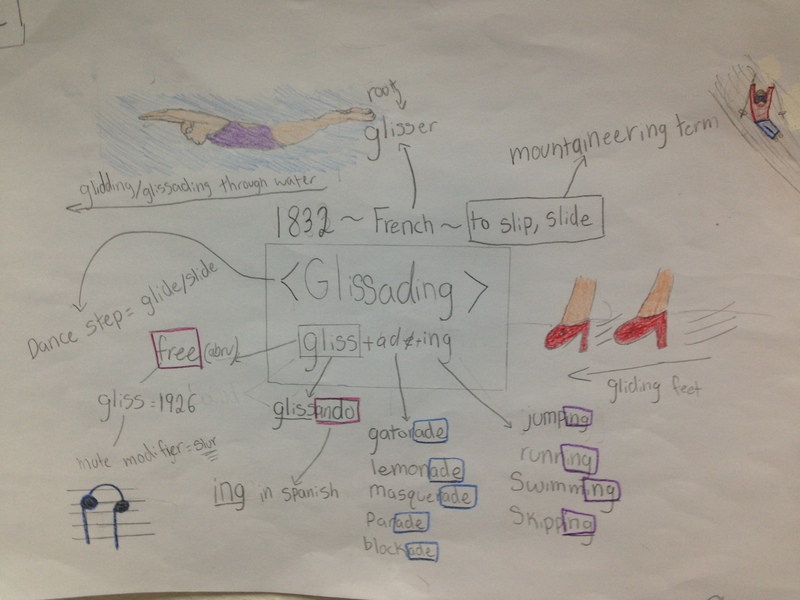 Phoebe discovered that the verb glissade first appeared in 1832 from French glisser “to slip, slide”.The base element in the word glissade is <gliss>. The base element is an abbreviation from glissando, the slide and flow from one note to another. Glissando was ‘borrowed’ in 1873 from Italian which was derived from French glissant. The Online Etymology Dictionary indicated the much older Proto-Germanic root *glidan “to glide” and from there we were directed on to glide which is ‘probably part of the large group of Germanic words in gl- involving notions of “smooth; shining; joyful”. We listed as many words we could quickly think of with the initial consonant cluster <gl>: glad, gitter, glisten, gleam, glimmer, gloaming, gleeful, glib, gloat, glitsch. After much dictionary delving, we discovered that these words share a common ancestor in the Proto Indo European root *ghel-(2) all with notions of slipperiness or shining! The following words do not share a morphological base element but echoing through them there is a sparkle and glint, or a greenish golden glow!! Go to Websters Dictionary Appendix 1: Indo European Roots to discover more. Glad: From Old English glæd <glad>, <glad+ly> and <glad+ness> shine brightly. The Old English etymon is from Proto-Germanic *glada- and derives from the PIE root of approximately 5, 500 years ago *ghel- (2). Both the OED and Online Etymology Dictionary note its current decline to a tepid state of pleasure and satisfaction, a weakening from its original sense of radiant brightness. And when considering radiant brightness and shining gladness, be dazzled by Blake’s painting below, originally called Glad Day. Gilt, gild and gold too are all etymologically connected to Proto-Germanic *gulthjan itself derived from *gulthan gold from PIE root *ghel- (2) “to shine” . All derivatives refer to bright materials, yellow colors, bile, and gold. So gall from Old English galla, as in gall stones from bile secretions, too is derived from this PIE root! The echoes of yellowness permeate this quartet. Gloaming <gloam+ing> attested since 1000 gloaming is from Old English glómung from O.E.glóm twilight, probably from the Germanic root*glô- . Therefore, it relates to <glow>. The etymological sense suggests the ‘glow’ of sunset or sunrise. Glee: from Old English gliu, gliw, gleow is attested since 700 from Germanic *gliiujam. The OED tells us of the chiefly poetic use of glee in Old English and Middle English. It denoted having fun and also referred to musical entertainment. After the 15th century, it declined in use, and in the 17th century had faded. Apparently Johnson regards it as a comic word , ‘not now used except in ludicrous writing, or with some mixture of irony and contempt.‘ This itself is ironic as on several occasions Boswell uses the term to describe Johnson’s reaction on seeing him! ‘Johnson welcomed my return with more than ordinary glee’ ( The Life of Samuel Johnson, by James Boswell Vol2.,1784). Inexplicably glee rises like a phoenix from the ashes to take on new life, towards the end of the 18th century. Glib: The adjective glib is smooth and slippery. Note the connection to German glibberig:slimy. The word is connected to the obsolete glibber and the wonderful glibbery of 1601 with its meaning of ‘slippery; shifty, untrustworthy’ (O.E.D.) Revive this word! I can immediately think of current political situations where this term can be put to immediate work! Gloat attested in 1570s carried a meaning of furtive looking perhaps from Old Norse glotta to ‘grin scornfully and show the teeth’. It took until 1868 to take on the sense of onlooking with ‘malicious pleasure’ or ‘malignant avaricious pleasure’, ‘to dwell on with fierce unholy joy’, as noted in sense 3 of the OED. Trace the links with glower, and glow to P.I.E. *ghel-(2) to shine. Glitter ( and aren’t we all better off for a little bit of glitter?) is from Germanic *glit denoting shining, bright which developed from P.I.E. *ghel-(2) to shine. And of course glitterati attested since 1956, a jocular blend of literati and glitter to refer to the famous, rich and glamorous. Glitch: The OED is hesitant about the origins of this word, stating it is slang and ‘etymology unknown’ whilst Online Etymology Dictionary calls this American English and suggests an attestation of 1959 from Yiddish glitsh “a slip,” from glitshn “to slip,” from German glitschen, it is related to German gleiten “to glide” and all the way back to PIE *ghel-. It began as technical jargon, then broadened into more common usage around 1962 influenced by the US space programme. Glint from Scottish is rather rare in the 15th century – the OED states the attestation is ‘not secure’, but rather more common in the 19th century , while glinter, is rare but morphologically related to glint from PIE *ghel-(2) to shine. Although of obscure origins and now no longer gleaming in the world of words, we rather liked the obsolete glaver of 1380 meaning ‘to flatter’. It is perhaps linked to the British north country adjective glave meaning ‘smooth’ and synonymous with glother, attested in 1400 meaning ‘to flatter and cajole’. Glimpse, glimmer and gleam came from the same *Germanic root *glaim-,*glim-. Glimmer as a noun from 1616 denotes:’ A feeble or wavering light; a tremulous play of reflected light, a sheen, shimmer‘ but is older as a verb (1400) and from Old English. 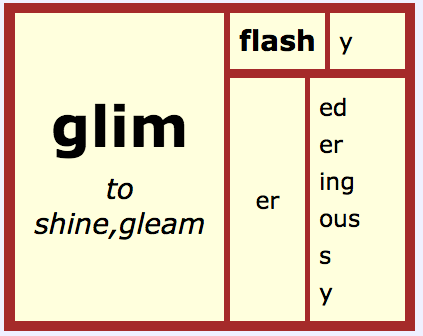 Glimmer <glim+er> has a frequentitive <-er> suffix suggesting flickering and repetition. The free base glim with its ‘obscure history’ is now obsolete, as is glimble,1616 . However, not so glime, a noun, denoting a ‘side look or glance’. Its older verbal sense, 1483, of ‘squinting’ or ‘looking askance’ or ‘shyly glancing’ is still a living word – a glimmer in the thesaurus where also the wonderful 1699 adjective glimflashy with its denotation of anger, glowers! Glamour: According to the OED, glamour as a noun was originally Scots, ‘introduced into the literary language by Scott’. It is a ‘corrupt form of grammar’. Glamour whispers of ‘enchantment and spells’, and is connected surprisingly to grammar. 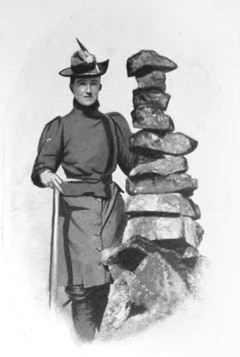 And to end with glamour – appropriate after so much sparkle and glitter – behold the intrepid glissader with the glamorous name Mrs Aubrey Le Blond, author of True Tales of Mountain Adventure For Non Climbers Young and Old, published 1903. 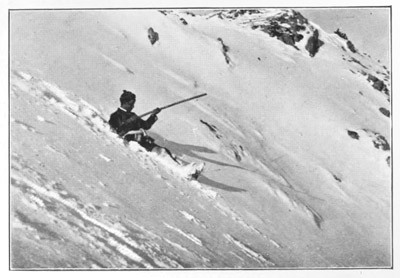 Note the photo from Mrs Aubrey Le Blond’s book- a ‘seated glissade’. Below, the famed ruby slippers worn by Judy Garland in The Wizard of Oz and despite the glamorous glitter and gleam, these shoes should NEVER be worn glissading down a mountain – no matter how much you want to get home!